I created an interactive learning experience designed to provide students and teachers with opportunities to focus on digital citizenship while engaging in constructive play. I hope many will enjoy using it, contributing to it and interacting with it. Many thanks to those who have already contributed content! You can embed this interactive graphic into your own site. Scroll over the top left side of the graphic and click the embed icon. A few years ago I decided to wind up the school year by offering busy teachers the opportunity to collaborate with me to learn to use a powerful tech tool in 10 minutes or less. I must admit the idea was appealing to many teachers at that very busy time of the year, and it actually generated a lot of interest. After all, who doesn’t have 10 minutes to learn to use a new tool? 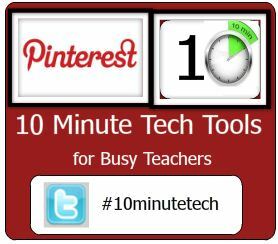 Recently some interest has been generated in those 10 Minute Tech Tools so I decided to create a Pinterest board of resources. All I had to do was scan my blog and use my Pinterest bookmarklet to pin the posts that fit the bill. Voila! Pinterest was an extremely efficient tool for this task. 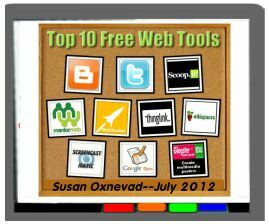 If you are interested in Free 10 Minute Tech Tools, please view the board on Pinterest. If you know of some free and useful 10 minute Tech Tools, please consider sharing through the Google Form at the bottom of the page via Twitter or email. Remember to include your name and a link so I can give you credit. I will pin suggestions that fit the criteria to the Pinterest board in the hopes of building a useful resource for busy teachers. 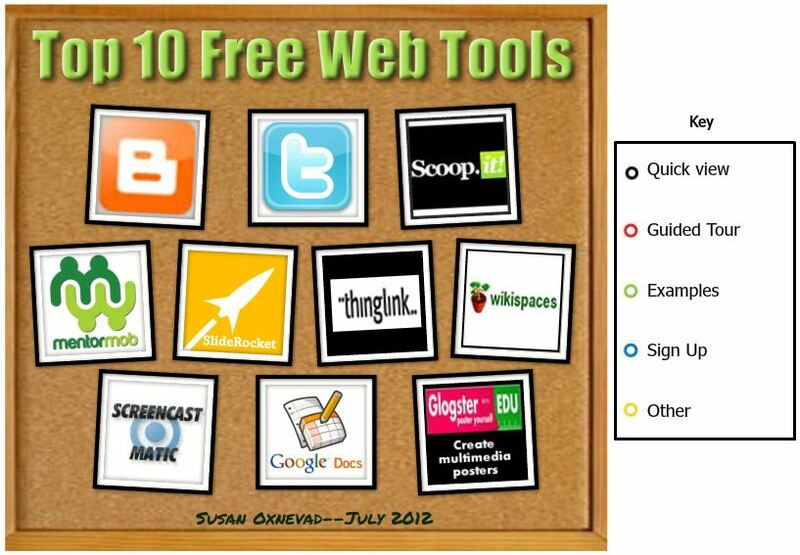 With so many free and user friendly tech tools available for teachers, it’s hard to know where to begin to put together a list of the best tools for teaching and learning so I decided to take a look at my own resources to determine which tools I use the most. Rather than posting another running list of tools, features and uses, I decided to present the information visually, through an interactive ThingLink graphic. I used the new colored nubbins available to make it easier for visitors to explore areas of interest more efficiently. Scroll over the image and click on the colored nubbins to explore this intertwined collection of resources. 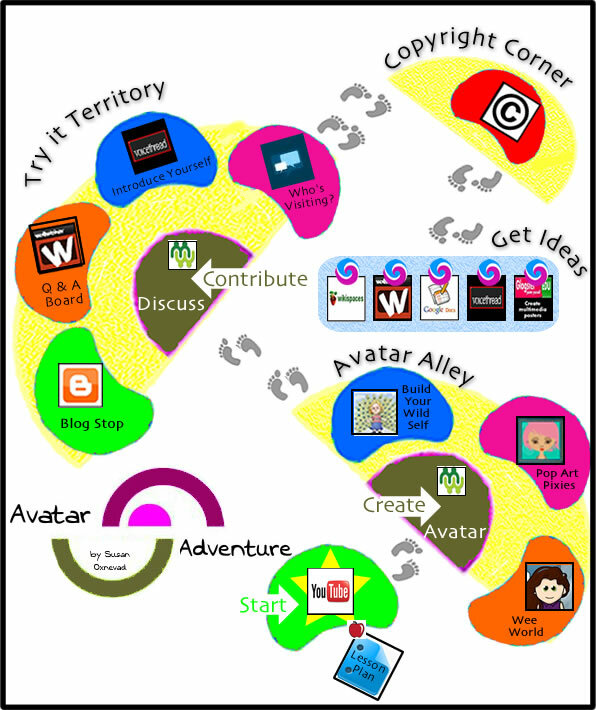 As you explore the graphic please consider contributing your own content to share examples of ways to use these tools in education. Cast your vote for the Top 100 Tools for Learning 2012 on the Learning in the Social Workplace blog, by Jane Hart.